The Midget and Midget T have been superseded by the Generation Three 1x12" models - Super Midget, Super Compact and Big Baby 2. The smallest cab ever that can hang with a rock drummer? 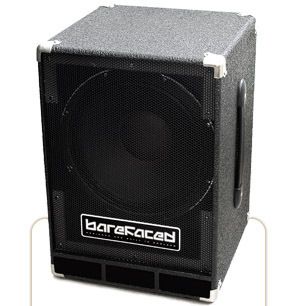 About 10 years ago we started seeing bassists using 12" cabs again, and notably trying these tiny new 1x12" cabs. For quieter gigs they've proven very effective, and for louder gigs a stack of two is a popular combination. However we don't see any point producing any cab that's just another run of the mill cab but with a different badge, we want to make a difference. So what sets the Midget apart? Despite the incredibly low total weight we are using what can only be described as a beast of a driver - it is expensive but it is worth every penny. This allows us to combine high broadband sensitivity with extremely high thermal and excursion limited power handling to get unparalleled SPL from a 1x12". 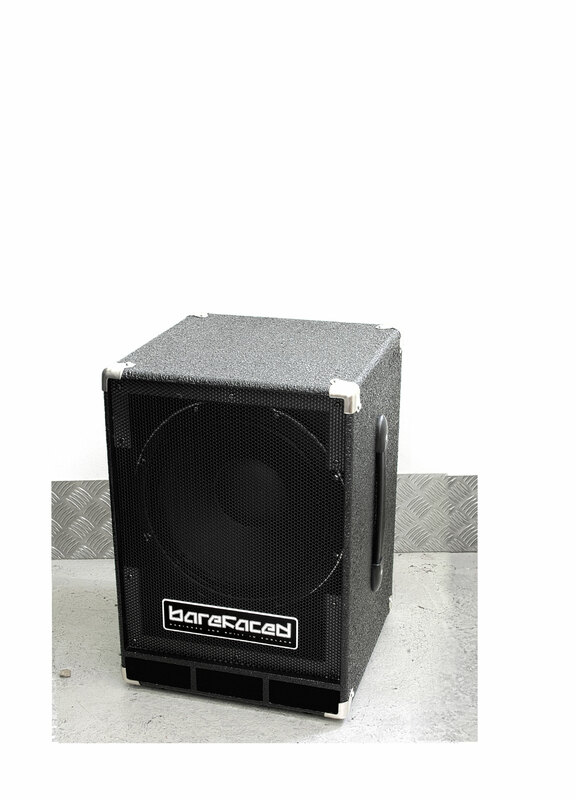 We have also been able to make our 1x12" even smaller than usual without suffering from midbass boom, so our Midget is closer in size to a 1x10" - to quote one of our customers: "Small enough to take home on the motorbike!!!!" As with all our Barefaced cabs it is braced and insulated to the nth degree to minimise unwanted resonance and distortions, whilst the port has sufficient area to allow our high Vd driver to produce almost unbelievable uncompressed low frequency output. But how loud can such a small cab actually go? We've seen a lot of 'interesting' specs being quoted when it comes to bass cabs, and the smaller the cab the further the specs tend to be from reality - some might accuse them of being 'Barefaced Lies'... So what is the reality when it comes to the Midget, what can it actually do? The key differentiator when it comes to how loud a bass cab can play is its ability to move air - this is a simple matter of the cone area multiplied by the cone excursion. Like all the Barefaced stable this Volume Displacement (Vd) is unusually high for the Midget, which means it can can produce unusually loud clean bass output for its nominal speaker size (and even moreso for the total cab size and weight). There are few 2x10" or 1x15" cabs which can produce as much bottom as the Midget and in the lower echelons of the cab world many 2x12" and even 4x10" models may struggle to give more fatness. Should you be the kind of bassist that plays those very loud rock gigs where an oversized PA is squeezed into a smaller venue you'll be familiar with the challenge of hearing yourself through the thundering drums, roaring guitars and PA subwoofer rumble. "But where's your real bass cab?" The Midget loves these situations - leave your bass EQ flat or even turn down the lows and let the extremely high midrange sensitivity and thermal power handling result in a dynamic punch that cuts through all that noise with no flab, wool or unwanted distortion. Ask any Midget owners just how disbelieving their bandmates were when they turned up with what looked like a practice amp... And how amazed they were afterwards! Would you like a coaxial tweeter to give you a fullrange point source with that, Sir? Many great bass sounds need some tweetery goodness, we won't deny that. As you may guess from the likes of the Compact we're not into selling you a tweeter if you don't need it, nor are we into relying on a tweeter to help a cab with poor transient response fake a quick attack. But if you want a tweeter then we've taken the trouble to design an integrated coaxial system for the Midget T, which extends the high frequency response to the limits of human hearing and through the magic of psychoacoustics results in remarkably consistent sounding response off-axis. You can have as much or as little tweeter as you desire thanks to the adjustable attenuator tucked away in the bass reflex port, so if you're having a fuzzed out doom day leave you tweeter off to avoid that spitty nastiness that happens when good evil distortion and nice tweeters collide. Then tomorrow turn it back up and act the smooth jazz funk slap hero. The Midget can form the cornerstone of a versatile modular system which is carefully designed to work in synergy, not just look nice. The obvious route to increased output is two Midgets, a seriously loud yet seriously tiny 2x12" stack which can move more air than almost any 4x10". But being Barefaced we have a far more cunning plan: the Midget can be stacked on the Compact to give an awesomely loud, clear, fat and punchy rig. Normally this wouldn't work terribly well but the driver in the Midget has a near identical motor to the driver in the Compact whilst the enclosures have been carefully designed to have well matched power handling and phase response. The result is that you can push huge power (1000W is fine) into the stack without either speaker farting out prematurely, whilst the loudness of both speakers is closely matched so neither's tone dominates the other, and the drivers are time aligned to tilt the polar pattern upwards towards your ears rather than towards the floor (as usually happens with smaller speakers on top of bigger speakers). If there is a 4x10" that can play louder than this stack we have yet to hear it! And if your amp can run down to 2 ohms it doesn't stop there - how about a Midget on a Super Twelve or a Midget on two Compacts? But before investing in going this loud, please invest in some good earplugs or your hearing will suffer!